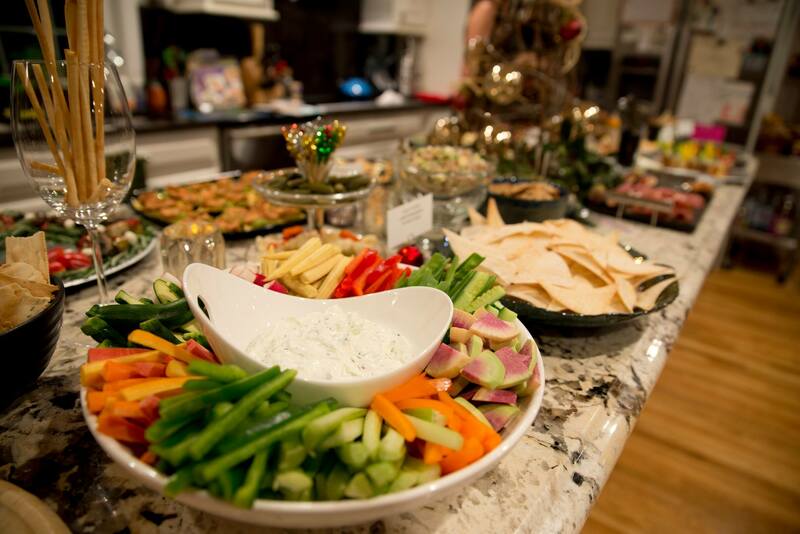 Every year we host a big holiday soiree… and every year, I try to find amazing new appetizers to add to my repertoire. This year, the theme was all about presentation — going above and beyond standard holiday fare. I wanted to come up with creative serving vessels, interesting dishes and beautiful styling, without sacrificing taste. 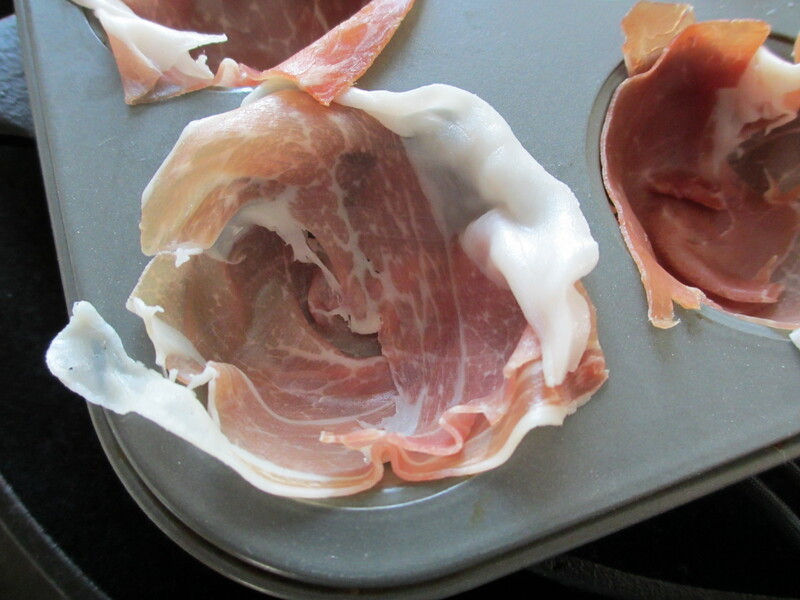 Preheat oven to 375 degrees F. Cut prosciutto into 24 two-inch squares. Place one square (overlapping any tears) in each cup of a mini cupcake tin. It can take a few tries to get this right. You have to play around with them a bit, making sure all pieces are overlapping so you have a good base that won’t leak once you add the filling. Keep in mind there will be considerable shrinkage during the baking process. Bake until fat turns golden, about 15 minutes. Using a fork, immediately transfer to a paper towel to drain; cool completely. In a small bowl, combine pear, honey, nuts and lemon juice. Place 1/2 teaspoon mixture in each cup just before serving. 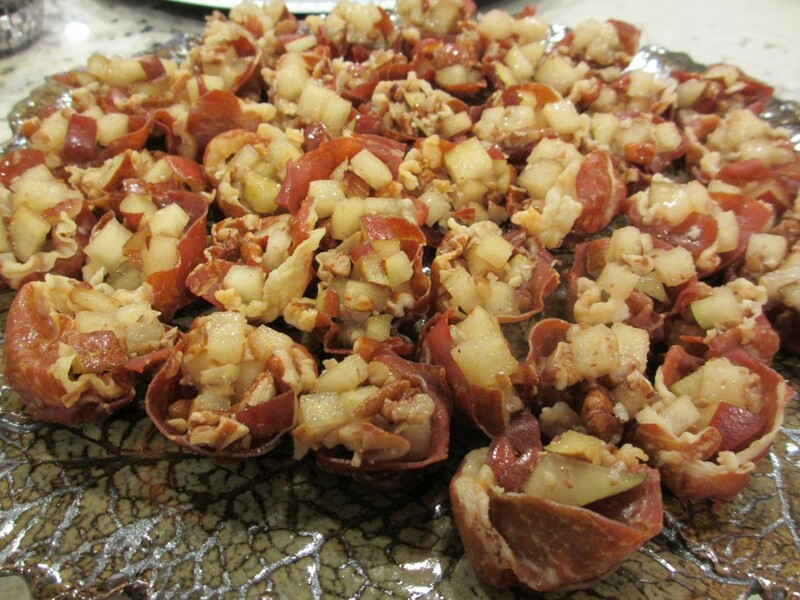 NOTE: Due to the overwhelming amount of prep work I had to do for this party, I cooked these about 2 days in advance. They still worked, but they weren’t as crsipy as they were on day one. If time permits, I recommend serving soon after baking. 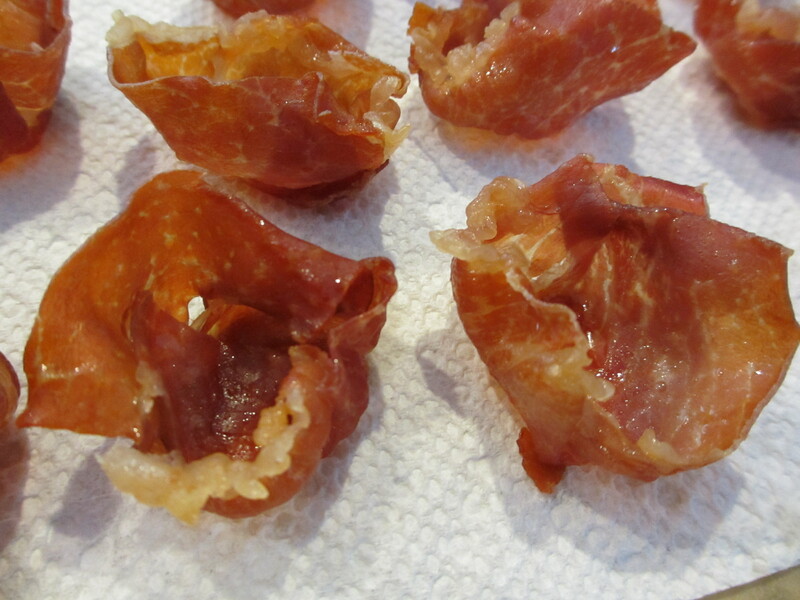 However, if you do need to make these ahead, let them cool 100% before you put them in an airtight container. Layer papertowels between them to help absorb the moisture and keep in a chilled location. 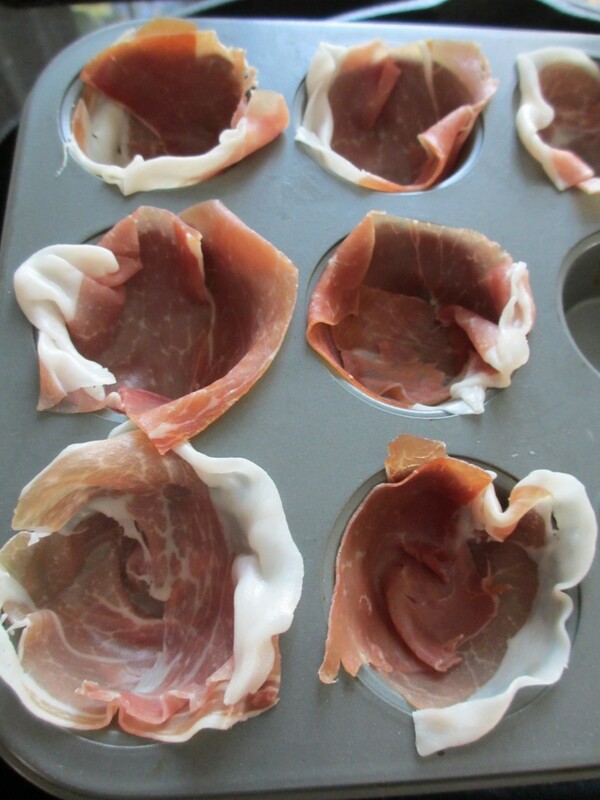 You can also make prosciutto chips instead of the cups. 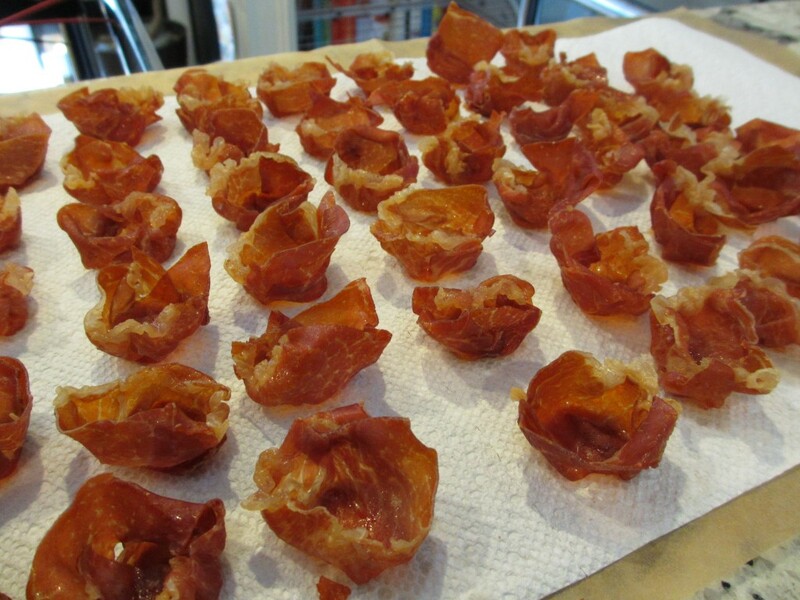 My local WholeFoods sells them and while I haven’t tried it myself, I’m guessing it would be pretty easy to do this by laying out pieces on a baking sheet. The key will be giving them enough space since they will weep fat as the cook… and you’ll want to make sure they pieces get crispy, so they will need to stay ‘dry’ during the process.